On this page I have compiled a list of useful information on the topic of choro and bandolim I have been interested in choro music for many years now, but until recently the most I had heard of Jacob do Bandolim’s music came from just one CD. After a stimulating discussion of the book ‘Tocando com Jacob’, I decided to investigate choro more thoroughly. What I discovered came to form the basic outline of this page. If you search the internet you can find a lot of information about choro music, its musicians and composers, instruments, and recordings. 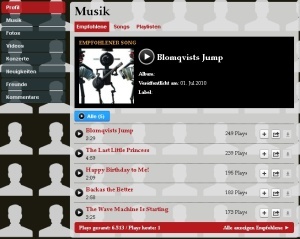 Many musicians have made individual tracks from their CDs available for streaming, and sometimes you can even find sheet music. 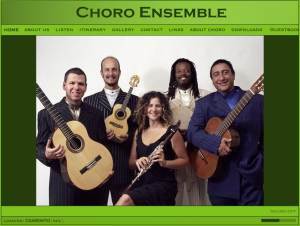 Choro music is a lot of fun and is above all a kind of music where the mandolin excels as a solo instrument. 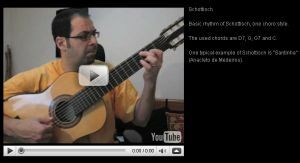 If you have a classical background and feel rhythmically secure, then a lot of choro pieces will be easy for you to perform. Other pieces, like Jacob’s recordings or those by the young Hamilton de Holanda, are greatly challenging, and even advanced players will require a lot of practice to perform them well. 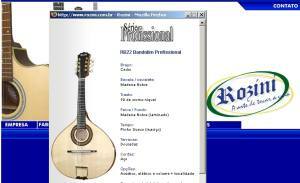 I hope that you find the information on this site useful, and that it helps to open up the world of choro music for you and other mandolinists. 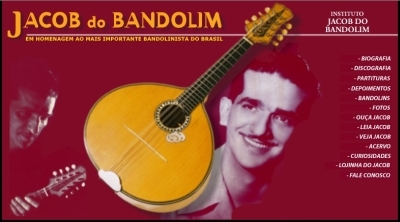 Some mandolinists who come from classical or bluegrass backgrounds play Brazilian choro as well, for example Marilyn Mair, Caterina Lichtenberg with the Trio Delicado, or Mike Marshall. 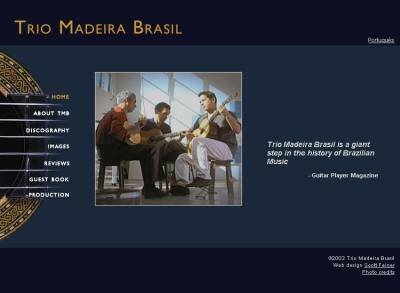 Brazilian Music Day is an online and live event offering thousands of links, videos, radio programs, historical essays, galleries, databases and discographies celebrating Brazilian music and culture. 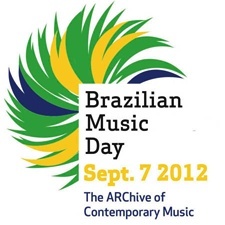 Brazilian Music Day website will post/host 20,000 ALBUMS, 5000 LINKS, 3000 VIDEOS, essays, broadcasts AND SO MUCH MORE! There will also be a major seminar up at Columbia University and dozens of concerts! Jacob do Bandolim was born in 1918 as Jacob Pick Bittencourt. Initially he began playing violin, but he soon switched to bandolim, the mandolin that became his instrument. After hearing choro music for the first time, he became an avid fan of the style and soon played it so well himself that at just 16, he could be heard on the radio. He is known as one of the greatest Brazilian mandolinists, and his pieces have influenced numerous musicians right up until the present day. This book contains transcriptions for the 24 pieces on two LPs recorded by Jacob in 1961 and 1962. There are two CDs that go along with this, containing each piece in two versions: the first the one from the LP; the second a version without the solo mandolin. Jacob recorded the accompaniment first and added the mandolin part later. Since these original recordings are included, it is possible to play along with the original accompaniment – as long as you master the piece. 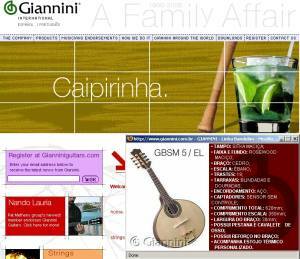 A major Brazilian manufacturer of instruments, strings and accessories is the Giannini company. They have several types of bandolim in their range. 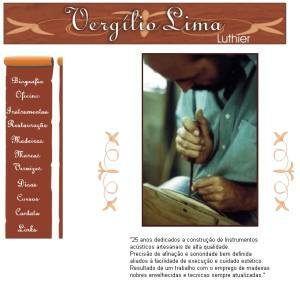 Vergilio Lima has been building instruments for 25 years now, including a 10-stringed mandolin. These manufacturers provide various instruments including two types of bandolim. 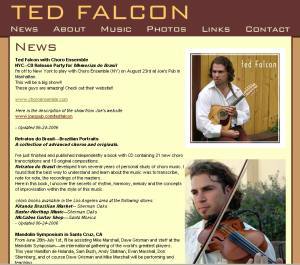 Hamilton de Holanda is a fantastic mandolinist – he plays choro pieces, but stylistically his music tends towards jazz. 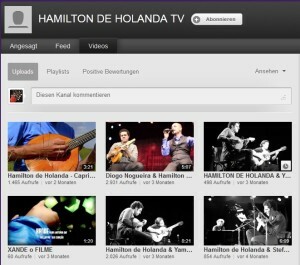 Homepage of Hamilton de Holanda with events calendar. 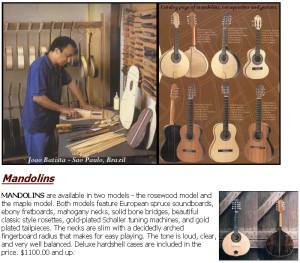 Rodrigo Lessa plays guitar, bandolim (the Brazilian mandolin), and sings. and classical music that calls to mind Villa-Lobos or Rodrigo – essential listening! Spanish style than Jacob, it almost sounds like Flamenco. And finally there is a great version of the slow waltz "Gloria" by Pixinguinha, another of my favourite pieces from Jacob’s recordings. Brazilian mandolinist and composer trained in classical mandolin in Italy at the Conservatorio Giuseppe Verdi with Maestro Ugo Orlandi. A master's degree in musicology from the University of Bras�lia (2008). 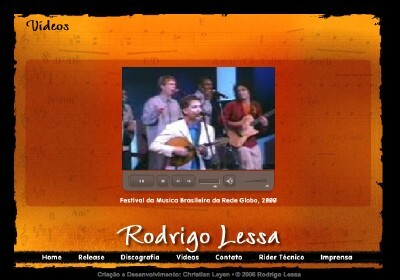 Search and dedicated to Brazilian music lectures and concerts in various countries. 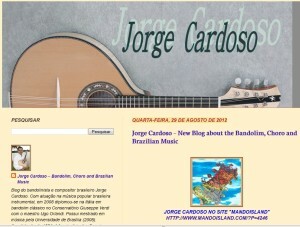 You can download sheet music for two of Jorge Cardoso's compositions at http://www.bandolim.net/. I have met Jarmo Romppanen in Trossingen at the European Mandolin Academy. He plays the bandolim in his band Nordic Choro. Danilo Brito is one of the bandolim players that are regularly teaching choro music at the mandolin symposium in California with Mike Marshall. 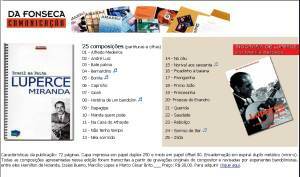 Audio samples and a detailed text about choro music. plays many different instruments, but especially violin and mandolin. He composes original pieces and has just published a book about choro with many transcriptions. He has already played with David Grisman, Mike Marshall and the New Yorker Choro Ensemble. On his homepage there is a lot of interesting information, pictues, further links, and above all, some interesting audio samples as well. 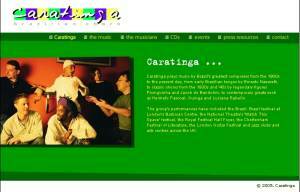 The group Caratinga consists of 6 musicians, including Anselmo Netto, who plays bandolim. 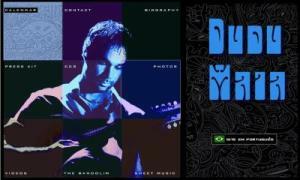 So far they have produced one CD, and you can listen to audio samples from it on the homepage. 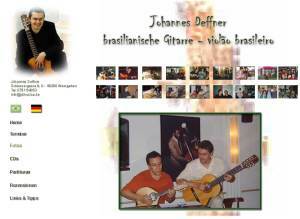 Johannes Deffner plays Brazilian guitar, from choro through samba to bossa-nova and Brazilian waltzes; he also plays cavaquinho. 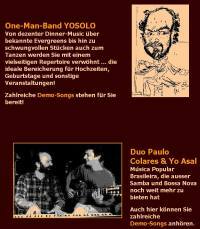 In Germany he also plays with the Ensembles „conjunto regional de Choro” Bolinhos de Bacalhau, with the Germano-Brazilian formation Brasileirinho and in the project Choro para Carmen. 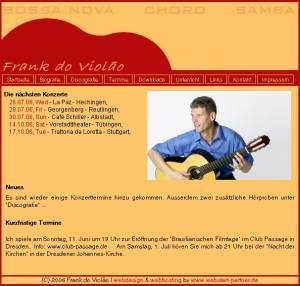 On his homepage there is downloadable sheet music for some of his guitar pieces, and audio samples from his CD suite brasileira. Another guitarist who is involved with Brazilian music and studied it in Brasil. Luperce Miranda (-> Wikipedia) was a Brazilian mandolinist and composer, who lived from 1904 to 1977. He can be heard on many recordings. His compositions are very interesting, especially his composition Quando me Lembro is a great piece. You can find more information in my Blog and in the choro blog. There is a book with 25 pieces by Luperce Miranda published by the publisher Da Fonseca. There are also some videos on youtube; I particularly like the video of Quando me Lembro, one of the best pieces by Luperce Miranda. In this piece there is a slow part in typical Duo-Style – the main voice as a tremolo on the E-string and fragmented chords as a second staccato-voice beneath that. 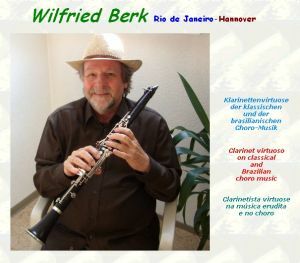 Wilfried Berk was born in Ipanema, Rio de Janeiero as son of German immigrants. He grew up in Brazil and studied the clarinet in Rio and Berlin. In the late 60s he moved to Hannover, Germany where he teaches the clarinet. He playes as a soloist and with different ensembles. Abdallah Harati is a guitar player form Brazil who wants to make the choro music popular around the world. He has studies in Berklee, was in Granada in Spain, in Germany, in Dubai and currently lives in Vietnam. On Johannes Asal’s homepage there is a biography of the Brazilian composer Pixinguinha in German and additional interesting information. 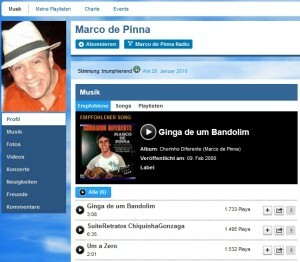 Of particular interest are the the long lists of links relating to Brazil und Brazilian music. 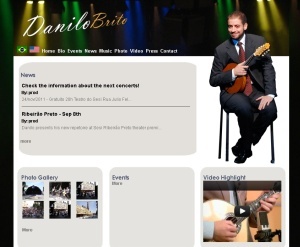 The homepage www.samba-choro.com.br is, as the name suggests, concerned with samba and choro. Particularly interesting is the extensive archive of sheet music, which you can download (after a free registration). On this page you will probably find less recent entries. 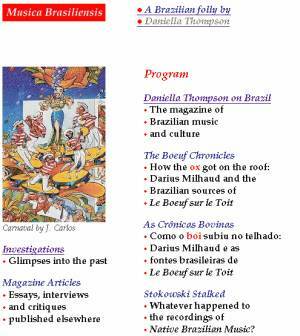 Via the link "A Brazilian folly by Daniella Thompson" on this page you can get to the current blog and other pages. A personal homepage is devoted to the Brazilian composer Ary Barroso. The review of Darius Milhaud’s "Le Boeuf sur le Toit" is very nicely done. Milhaud spent some time in Brazil and developed many Brazilian tunes in this opus. Daniella Thompson identifies this and lets you hear examples from Milhaud’s work – and also, for comparison, many original recordings of the corresponding pieces. A lot of pictures illustrate this series of fascinating articles. On the homepage there is also a discography for "Choro", which is admittedly not completely up to date, but is certainly still interesting. In any case, I will take a closer look at these pages – I think I will find a lot more to read there. 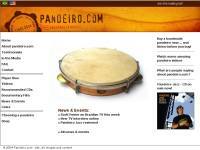 A homepage about the Pandeiro www.pandeiro.com - here you can order handmade Brazilian Pandeiros. 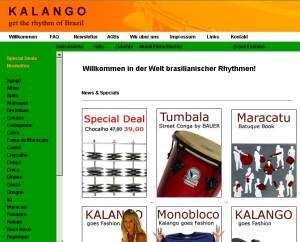 In Germany it is probably easier to order Brazilian percussion instruments, but also guitars and cavaquinhos, at Kalango. Perhaps you can even find Brazilian bandolims there. Bom dia & Good Morning, Michael! Thanks again for the great work you are doing with MandoIsland!